Close to 5,000 participants, including ministerial officials, business leaders and professionals from 55 countries and regions attended the third Belt and Road Summit today (June 28), at which over 500 one-to-one business-matching meetings with over 220 projects were arranged to promote business deals. Themed "Collaborate for Success", the Summit started with the Chief Executive, Mrs Carrie Lam, delivering an opening address, followed by special addresses from the Chairman of the State-owned Assets Supervision and Administration Commission of the State Council, Mr Xiao Yaqing; the Vice Chairman of the National Development and Reform Commission, Mr Ning Jizhe; and the Vice Minister of Commerce, Ms Gao Yan. The Deputy Prime Minister of Thailand, Dr Somkid Jatusripitak, delivered a keynote speech. 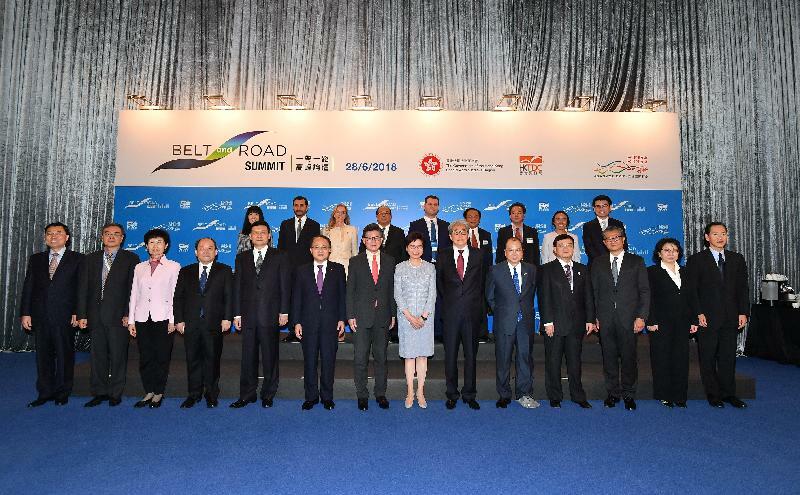 Mrs Lam said in her opening address that wide participation from different parts of the world is important for the successful implementation of the Belt and Road Initiative, as its pursuit requires a high degree of co-operation between countries and the establishment of a sound bilateral and multilateral mechanism, as well as participation from different sectors. 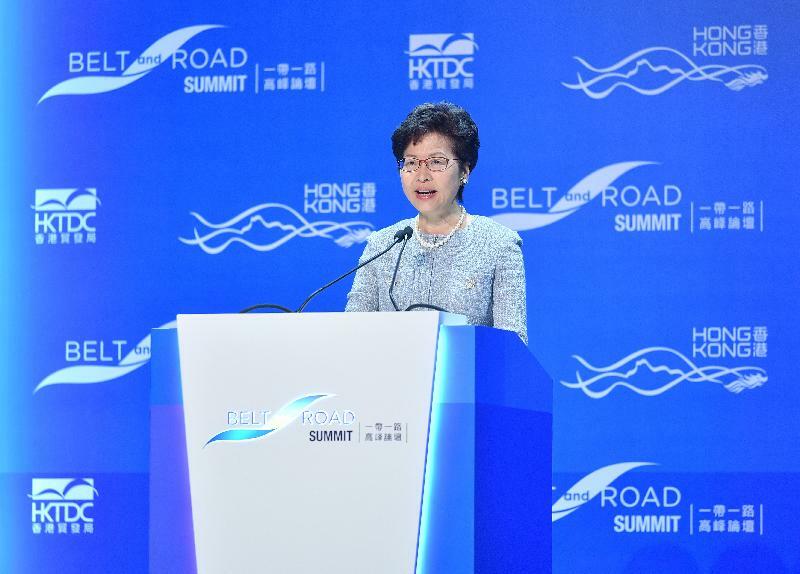 She said, "Hong Kong, being the world's freest economy and China's most international city, is destined to play a significant part in the Belt and Road Initiative. "Hong Kong will contribute to the Initiative across all areas of its wide-ranging connectivity, from policy co-ordination, financial integration and trade, to infrastructure and people-to-people bonds. "Hong Kong's singular most important advantage in playing an active role in the Belt and Road Initiative is the 'one country, two systems' framework that propels our development in the past 21 years. It allows us to expand our traditional strengths as an international financial, trade and logistics centre, while deepening our economic integration with the Mainland." Mrs Lam also pointed out that the development of the Guangdong-Hong Kong-Macao Bay Area would boost interaction and integration within the region, encouraging strategic partnerships between Hong Kong, Guangdong and the larger Belt and Road region. The Financial Secretary, Mr Paul Chan, delivered openings remarks at the luncheon plenary. The session consisted of a ministerial dialogue chaired by the Secretary for Commerce and Economic Development, Mr Edward Yau, with the participation of four overseas ministerial officials. The four ministers were the National Security Advisor, Union Minister for the Ministry of the office of the Union Government and Chairman of the Myanmar Investment Commission, the Republic of the Union of Myanmar, U Thaung Tun; the Deputy Minister of Economy and Sustainable Development, Georgia, Mr Genadi Arveladze; the Minister of State for Trade and Export Promotion, the United Kingdom, Baroness Fairhead; and the Secretary of State, Ministry of Public Works and Transport, Kingdom of Cambodia, Mr Lim Sidenine. They shared their insights on how the Belt and Road Initiative would enhance multi-lateral partnerships. 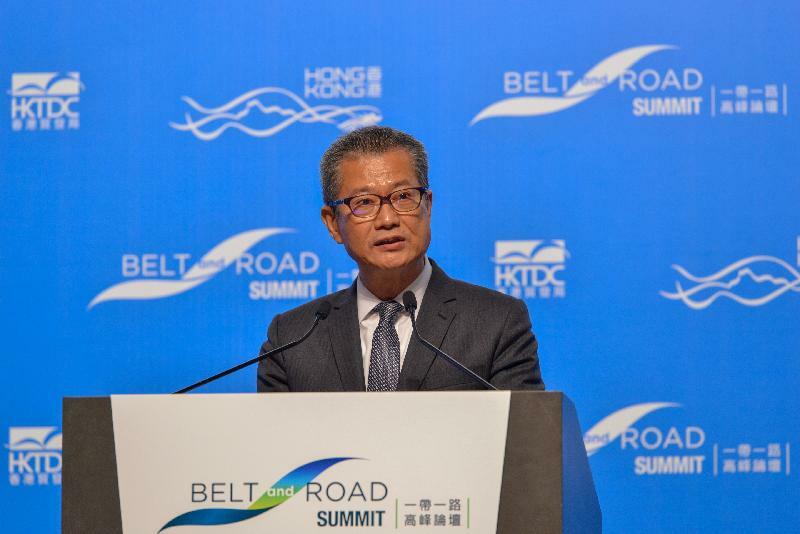 Mr Chan said, "For decades, Hong Kong has been the pivotal gateway connecting China and the world. We are strategically positioned to serve as multiple platforms for the Belt and Road. "As one of the world's leading financial centres and China's international financial capital, Hong Kong can be the platform for capital formation and funding. Our deep liquidity, premier financial infrastructure and comprehensive options for raising capital, from traditional IPOs and loan syndication to bonds and the more sophisticated Islamic sukuk, can meet the financing needs of the mega Belt and Road infrastructure projects." He pointed out that Hong Kong was also the Belt and Road platform for high-end professional services and the platform for enterprises to find the right partners, as well as to base their offshore operations. 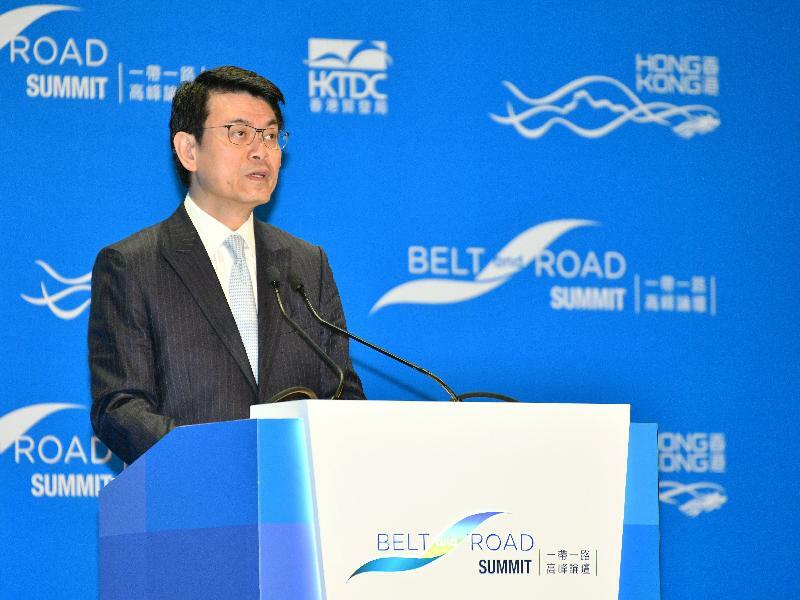 In his lead-in speech this morning, Mr Yau highlighted five distinct areas where Hong Kong could offer itself as a platform for collaboration with those who want to leverage on the opportunities arising from the Belt and Road Initiative. The five areas are policy, positioning, professional services, project inception and partnering. The Secretary for Justice, Ms Teresa Cheng, SC, also spoke at the panel session on "Deal Maker in International Cross-Border Transactions". 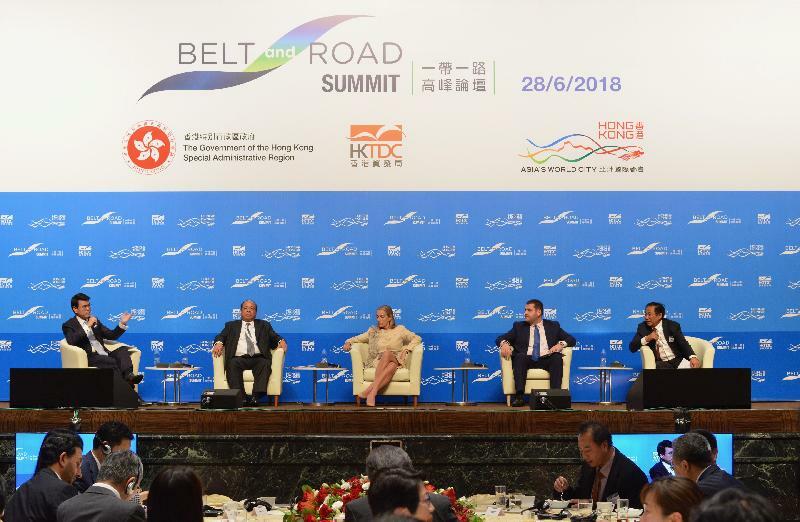 Jointly organised by the Hong Kong Special Administrative Region Government and the Hong Kong Trade Development Council, the third Belt and Road Summit featured a main plenary session, a luncheon plenary, nine thematic breakout sessions, full day investment and business matching sessions and three project pitching sessions, with the latter focusing on energy, natural resources and public utilities; transport and logistics infrastructure; and rural and urban development.